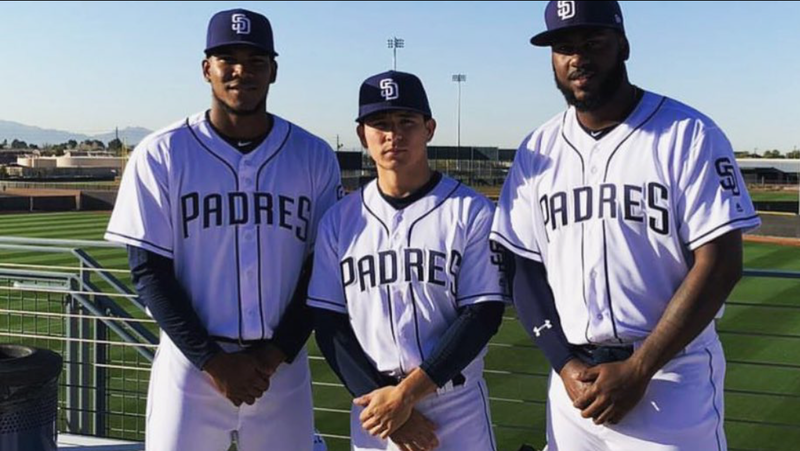 There is plenty of talk about who the San Diego Padres should sign this winter, but perhaps it is just time for the team to just let the kids play. The 2019 Padres season is poised to be another year of evaluation at the big-league level and it should not be limited to the pitching staff. In my last article, I looked at the staff and the list of candidates currently on the roster aiming to make the rotation. In this piece, we will look at the starting lineup, and right away there are some parallels with the rotation. 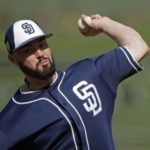 The Padres will need to be creative to get the most out of these players by either playing them or maximizing their value now via trade. The biggest decision is where Wil Myers fits with this team. The recent announcement that Myers will be moving back to the outfield creates a new problem and strains an existing one. The announcement not only further clogs the outfield, but it leaves the team without a third baseman. Myers was never going to win a Gold Glove at third, but his athletic ability and strong work ethic gave hope he could be serviceable, if not effective. That thought can be thrown out the window with the announcement. 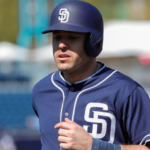 With third base being the Padres’ weakest position at both the big-league and upper minor-league levels, they will most likely turn their attention to the recently claimed Greg Garcia and prospect Ty France. France continued to show he can hit despite his perceived low ceiling as a prospect, hitting a decent .287/.382/.532 in 25 games after being called up from Double-A San Antonio. 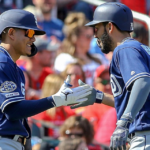 Freddy Galvis gave the Padres stability at shortstop in 2018, however, he is not expected back after the Padres signed 36-year-old Ian Kinsler in December. Top-prospect Fernando Tatis has been tearing up the Dominican winter league and is most likely ready now, let alone by the start of the season. 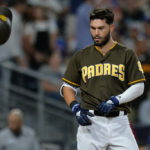 But the Padres will most likely exercise the “Kris Bryant Rule” and hold off on starting his service-time clock by keeping him in Triple-A through the first few weeks. Until then, we will likely see either Kinsler at shortstop and Luis Urias at second, or vice versa, with Jose Pirela backing them up. Javy Guerra may make the club as a defensive specialist, but his weak bat will keep him out of the lineup for the most part. At first, Guerra was the jewel of the Craig Kimbrel trade. He has struggled mightily at the plate, though, and is prone to strike out a lot. There is plenty of power here and an absolute cannon of an arm, but at this point, he is more of a wild card in the infield this year. Getting back to Myers; he comes in as the second-highest paid player on the team after signing an $83 million deal in 2017. According to SpotTrac, the team-friendly contact will only cost the club about $14.5 million through the end of the year. But that figure will start to climb in 2020 when he is due a big raise from $5.5 million to $22.5 million annually. With a hard time keeping healthy and an inconsistent presence at both the plate and on the field, many are losing faith in the former AL Rookie of the Year. You throw in his perceived lackadaisical attitude and a Forenite video where he criticizes his manager, you see how some came to that conclusion. In his defense, being paraded around as the face of a franchise when he clearly was not ready for such scrutiny must not have been easy. He has also been shuffled around the field since arriving from Tampa Bay, playing all three outfield spots, first base, and finally third base. No stranger to the DL since his days with the Rays, Myers places a lot of torque in his swing and plays the field aggressively by throwing his body around. Add to that the unfamiliarity of playing several new positions and you can get a sense that this may have contributed to his stints on the DL as well. The outfield surplus is well-documented, and Eric Hosmer is entrenched at first base, leaving few options for Myers. The Padres need to decide if he a long-term member or if he may, in fact, be the odd man out. 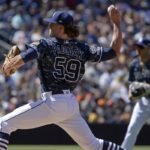 With $60 million due from 2020 to 2022 and a three-year option starting in 2023, Myers and the Padres seem to be stuck with each other. 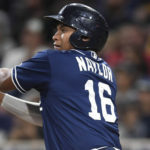 Whatever the case may be, Myers will join an already young and talented outfield that includes Franmil Reyes, Hunter Renfroe, Franchy Cordero, and Manuel Margot and Travis Jankowski. That is a lot of names for only a few positions. Last year, many of the fans fell in love with Reyes and his infectious attitude and play. 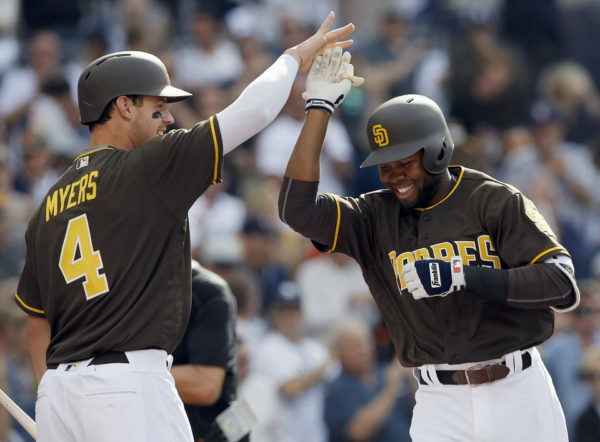 In both Reyes and Cordero, the Padres have absolute mashers who can hit bombs 475 feet with ease. 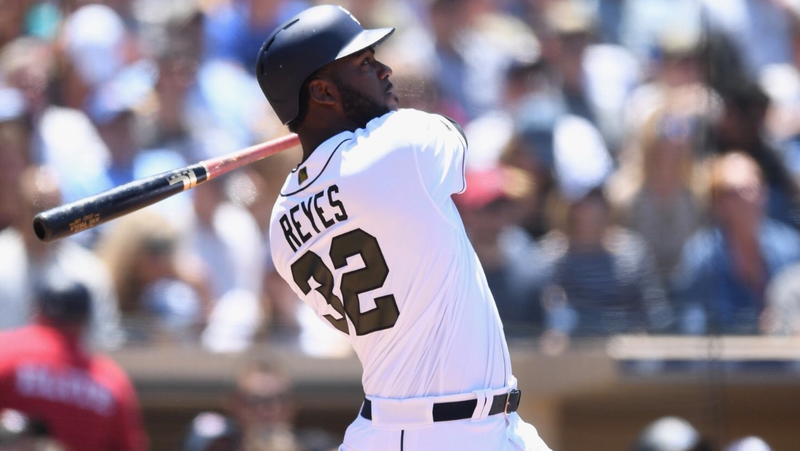 Reyes showed he can be dependable at the plate and make good contact, putting up a .271/.338/.465 battling line in his first season. Cordero was injured, but when healthy, gives the impression that he can break out at any minute and become a star. The term “five-tool player” is thrown around a lot, especially by bottom-tier teams as they try to hype up a prospect. We all remember Ruben Rivera. But rarely are there players who truly can hit, hit for power, run, field, and throw. Cordero may be the first Padres player to have these attributes since Dave Winfield. Renfroe, no slouch himself, struggled to make consistent contact, but when he did, it was usually for extra bases. Last year, 50 of his 100 hits were for extra bases. Like most young players, strikeouts and inconsistency have plagued his career so far. He will need a strong start in 2019. Another highlight of the Craig Kimbrel trade, Margot slipped last year, but came on strong towards the end. Clearly, Margot deserves to start, but is that in San Diego? Beaned, beaten, and benched last year, Margot looked lost in the field at times and was an utter mess on the base paths. He is still only 24, and with the power potential of Cordero, Reyes, and Renfroe, he may be pushed to the bench again this year. Sophomore struggles are a real thing and the progress he made late in the year cannot be overlooked. I expect him to bounce back, and we’ll see more of the 2017 version of Manuel Margot. The names may not be elite, but there should be a good starting outfield somewhere in that group. With so many pitching and positional players vying for a spot, the time to pull the trigger on a true ace may be better suited for this time next year. The recent rumblings involving Kluber are an indication that Preller may agree. Most rumors have them moving him right away for a possible starting third baseman. Are you really getting the value at the right time from a Kluber-like pitcher than you would from the pieces assembled through the draft and international signings over the last few years? I don’t know. But for me, I would like to see the Padres go for it and play the kids. Let’s see where it takes us. A life-long San Diegan and proud father of two. I have followed the Padres since the '84 World Series and I am excited to give a fans perspective of the club. One last thing, hold off pursuit of the “ace”, unless the deal is too good to pass. Struggle through with the young arms and a veteran reclamation project or two. 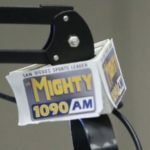 Pads current minor league strength is pitching, so give them a shot and let’s see who fits the long term plan. The Padres may bring back Galvis to play SS until Tatis is ready, or go with Urias. I would be surprised if Kinsler plays SS. This sounds crazy, but the Padres need to step up and be the highest bidder on Manny Machado. Adding Machado at 3rd would give the Padres one of the best defensive infields in MLB once Tatis and Urias get acclimated to MLB. Think of the offense once Edwards gets to the Padres after a position change to CF and bats lead off. 8. Reyes/Naylor – DH if the NL adopts the DH, both of these guys would fit here perfectly as would Austin Allen. 9. Hedges/Mejia – C Good defense with Hedges and some power (15+ hrs) Mejia should also get better defensively and is capable of 20 hrs. Given that this lineup would include 3 expensive contracts it looks like a long shot, but the Padres can do this as most of the Pitchers and Position Players are making the MLB minimum. Wil Myers contract runs out after 2022 when some the young players salaries start to go up slightly. Under this scenario, the Padres could also go get Gerrit Cole next season. The upper limit for Team salary is roughly $150 million. Machado, Cole, Hosmer and Myers could be had for $110,000,000 or less. After 2022, Myers $22 million comes off the books. The Bullpen would also be among the best in MLB. In addition, by 2022 the AAA Team should be full of many MLB caliber players in case of injury or trades to fill roster holes. 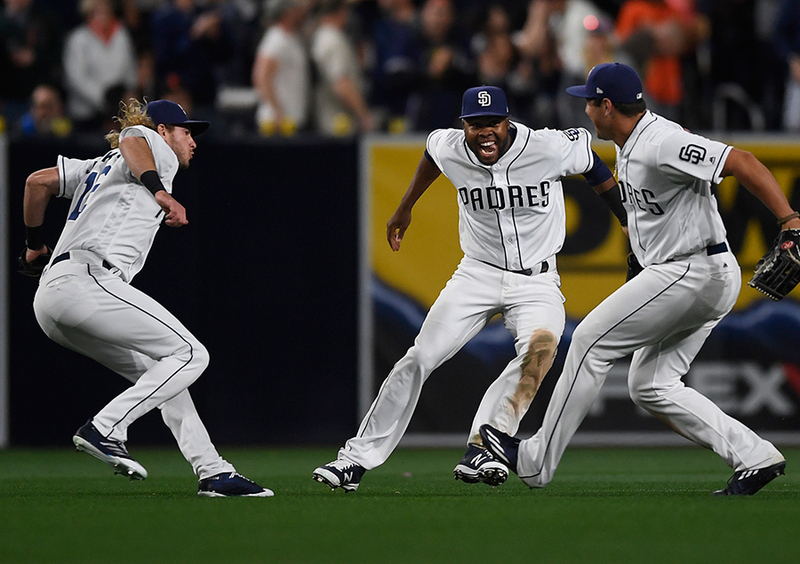 Beginning in 2020 and for the next 5 – 7 years plus, The Padres will be a threat to win it all. If the Pads were willing to step up and get Machado, that would definitely send a message that the organization is about “winning”. But, like you said, it’s too “crazy” to consider. Plus, from what I’ve read, Machado wants to play S/S and the organization has pushed Tatis in that spot. Guess it could be worked out (Jeter/AGon) but who needs the drama. Interesting that you have Edwards moving to CF. He’s a little guy with lots of speed, not much power, “top of the order” guy and I see him moving to 2nd with Urias being traded for prospects. If things don’t change between now and Opening Day, I’m guessing Cordero goes down to Triple A to work on reducing his strikeouts and his “D”, and probably Reyes, as well. He had surgery on his knee so could use the time to rehab. Renfroe came on in August and September, so he’ll have a couple months to show if it’s real or not. Myers isn’t going anywhere and looking for Margot to bounce back and have a better year. If the 3-team rumor surrounding Kluber is true and the Pads need to give up two OF’s (plus minor leaguers) to get Sensul from the Reds, I’m ok with any combo of Renfroe/Margot or Reyes /Margot being traded. The one who remains get RF. While Jankowski is better as a 4th OF’er, he’ll hold his own as a starter. And Cordero is the backup until he earns more. Make due in the infield until Tatis comes up, then it looks like Kinsler and Garcia are utility. Leaving Mejia and Pirella (???) as bats off the bench. I’d be happy with that.